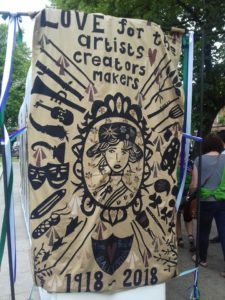 On 10th June, we four sisters – collectively artists, cultural practitioners and feminists – participated in Processions 2018 in Belfast, a mass-participatory art work celebrating 100 years since women in the UK first got the vote. Bryonie has written before about how, for us, quarto represents a fresh approach to our working lives that supports our feminist principles. Working collectively allows us to be more creative and ambitious in our professional lives, while also providing a supportive, flexible environment that sustains our personal lives as we continually embrace new opportunities and challenges. As quarto, we have been involved in a number of projects encouraging local communities to learn about and participate in the ‘Decade of Centenaries’. With them, we have uncovered new perspectives on momentous events in Irish history and opened up dialogue about their continued resonance in our lives today. Along the way we have been privileged to discover many stories of radical, visionary and resilient women. And we have been confirmed in our sense of the transformative power of complex, interwoven narratives of the past. A centenary is a portentous moment in time, encompassing past, present and future horizons. In investigating the sometimes-contentious events of 100 years ago we have inevitably been challenged to consider how they can and should be remembered today. The act of commemoration is of course largely shaped by contemporary political and social concerns, and commemorative events have significant potential to reaffirm communal division and conflict. That potential is greatly magnified depending on the form in which a commemorative act takes place. As we have explored theory and practice in relation to commemoration, place and identity in contested societies, we have noted that commemorative acts may close down the historical narrative or hold the potential for opening up new perspectives. Monuments, statues and memorials, by their very permanence in form and the authority with which they are given permission to exist in public space, are the most obvious example of a narrow interpretation of the past, based on a single event or individual, that allow no possibility for debate or dialogue. In a contested society monuments very often commemorate an act of violence or tragedy and therefore become an object of further conflict. Though the museum sector endeavours to present multiple narratives on the past and uncover forgotten or excluded perspectives, the ways in which exhibitions are constructed and perceived by the public still tend towards the didactic. As a visitor, you may of course interpret an exhibition as you wish, and you may debate your views on it with others, but these conversations largely take place in private, not in the public sphere. But where a commemorative act is temporary, informal, creative and performative, it allows for different, disparate and even conflicting ideas to exist in tension in the same space. It was this aspect of Processions 2018 that attracted us to participate, and we were not disappointed in its actuality. across the country to produce handmade textile banners. The results were truly stunning, both honouring the traditions of women’s craft, artistic expression and political activism and at the same time promoting current concerns relating to women’s rights. 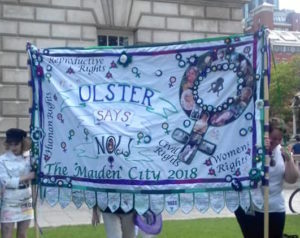 As we made our way through Belfast city centre, we witnessed women in Edwardian costume celebrating our Suffragette ancestors, walking alongside others wearing T shirts or badges emblazoned with ‘Repeal the 8th’ or ‘Love Equality’. Belfast had a very different political energy to other cities in the UK taking part, and our friend Kellie Turtle has already written about this with greater insight and eloquence than we can attempt. But from our own perspective, the large and vocal presence of pro-choice campaigners, in the same public space as many different female voices, was significant. The response they received was mixed; many bystanders were notably reticent to vocalise any support, whereas the majority of event participants seemed to enthusiastically welcome their presence. For us the uneasy tapestry of the event seemed to capture a significant moment in Irish political history, a sense of an outpouring of women’s voices that for a long time have been excluded from the public arena. How that energy evolves over time will be fascinating to witness and be part of, no matter what our personal viewpoints may be on current debates. The ability of Processions to respond to local dynamics, to allow people to express disparate identities and viewpoints in the same space, no single group taking dominance over another, was the most significant aspect of our experience of the event and reaffirmed our conviction about the positive role of art in commemorative practice. Women from across the social and political spectrum had come together to celebrate, support and inspire each other, and it was a moving experience we are proud to have been part of.